Modus Hoperandi | Ska Brewing Co.
An American-style India Pale Ale with a deep golden-orange color. Bitter and hoppy, with a surprisingly smooth finish. Good appearance. Dark amber with ruby hints. Nice head and lacing. Very appealing mild citrus and stronger pine aroma. Totally correct for the style. Not a super strong aroma but quite good. Taste is typical American IPA and similar to SN Torpedo to my taste buds. Good balance of sweet and bitter. Not huge citrus tatses but a bit of orange is there. Nice piney flavour, resinous feel and solid malt core make this a good drinking IPA. IBUs are noticeable and welcome! Overall, a very solid offering and rendition of this renown style of beer. Perhaps nothing outstanding or remarkable for those who've tried a few of this style but definitely enjoyable. This would have a wow factor for anyone not used to big, hoppy US beers. M&D - Quite smooth with just a little sharpness coming through... Light / medium bodied... supremely quaffable..
S - glass smells of citrus (orange peel, mango, grapefruit) and flowery pine, can smells incredible after the pour with lingering floral notes. Getting it over an arms length away. T - medium body.. small bitterness with the malt up front. Good balance with hop residual in the back. Not overpowered whatsoever - good malt presence with good balance. M - bubbly and warm. Thins out a bit near the end. On can #5 of the six-pack, I think it's time for a review. This is a great-looking IPA, copper colored, slightly cloudy with a bone-colored head that sticks around. Taste and smell is a burst of hoppiness - though not sharply bitter. It is an exuberant, thoroughly enjoyable hit to the palate. This is a top notch IPA. Will grab it again, as it is thankfully always at my local Central Market in San Antonio! The beer is ready to go in the bright red color. The foam is white with small bubbles. The foam disappears leisurely quickly and leave fine traces. Aromas of tropical fruit and hops. A little malt, citrus, spicy pine and orange peel and light caramel. Small smells of bread. The flavors go in hops and bitterness with bitterness a bit thin. Tropical fruits where lemon come first, followed by a little orange. Some malt, a little earthy and sweet tones. Lightly toasted and a little caramel. Good roundness with medium long finish that does not have too much hops or bitterness. Medium body. Moderate carbonation. Dry surface, small roughness. The beer is not a real hop bomb with high bitterness. It has a good round balance that will not be too much. Poured a hazy Amber with a great light beige head which left a ton of lacing. Smell was of earthy hops and pine, line walking through a forest where it had freshly rained. You can totally smell the leafy foliage and pine here. Taste was of caramel malts balancing some resinous pine with citrus character. Some orange and grapefruit but I'm still getting lots of pine and earthiness. Less bitter than I expected and more malt-balanced. After exploring IPAs from the East and West Coast I am seriously enjoying the IPA offerings from Colorado (Great Divide and Ska especially) and Michigan (Bell's and Founders) which seem to have considerable more malt backbones to balance the hop flavors. Great beer, this one. Great to see Ska come with an IPA and a top notch one at that.Poured into a standard pint glass a dull hazed amber/bronze with a super clingy 1/2 finger white that left rings of lace behind as it never fully settled.Wow resin,resin,and more resin in the nose!That along with grapefruit rind a some caramel,for me its perfect,hence the rating.Flavors dont hit quite as hard as the nose but the hops rule,big pine resin and citrus,the caramel base does hold strong though making for not quite balance but near balance.A great IPA with assertive hops...the way it should be. Wow. This beer is just pure hop resin in a glass. Coming in at 88 ibu's, this brew just coats your mouth with the best bitterness you can imagine. The nose is piney, citrusy. The taste is to seriously die for. Just resinous as can be. The after taste of hop flavor is killer. A really solid malt backbone as well. This beer is perfect. I will definitely be buying this regularly. Has the taste of a double IPA, but is really just a single IPA. So great. Well done Ska. Look: Hazy amber in color. Inch and a half of creamy white head has some sticking power. Settles to a nice ring around the edge of the glass. Thick heavy lacing. Smell: Earthy and Forest-y. Lots of pine. Taste: Extremely well balanced. Big dank citrusy hops is paired brilliantly with a toasted, almost chocolatey malt. Feel: Medium body with a nice semi dry finish. Kinda oily. Overall: Not out of this world complex but hits all the tent posts for a good American IPA and has some nice, interesting, unexpected qualities. I love constantly trying bad beer after bad beer because eventually something like this comes around and knocks your pants off when you weren't necessarily expecting it. L- Amber body with a two finger off white head. Great head retention and a lot of sticky lacing as take several sips. S- All I get is hops, hops and more hops! Just a fantastic invasion of piney, fruity and citrus aroma as I take each sip. T- now this is what I love, relatively low hop bitterness but a massive amount of hop flavors. Primarily sticky pine, grapefruit and peppery bitterness (in a wonderfully subtle way.) It's malt base only comes through slightly in the end to balance out the hop bitterness. F-Medium-light body, slightly sticky lingering bitterness. O- The IPA that got me into the style. I first had it fresh of the canning line before they topped the can on a brewery tour in Durango. In my top 5, maybe 3 CO IPA's! Thanks to Orthodoxkardia for this one. 12oz can. Pours a dark brown with an inch of frothy white head. Fair amount of lacing. The aroma is piney and dank hops with some caramel. Floral and resinous. The taste is more pine and resinous hops. Floral, grassy hops as well as some more caramel malt flavor. Earthy. Finishes with more of the pine sap taste. Medium bodied with a slightly chewy mouthfeel. Overall, very piney, resinous IPA. Above average IPA. Lacking special character in any department but well-rounded in it's character. Doesn't quite do it for a hophead. Sprucy and grassy with some bitter citrus to back it up. Mouthfeel was too dry, crispy and even a little foamy. If the mouthfeel was a little better I might find this one more appealing. Such a delicious beer! Very citrusy in taste with plenty of hops. Good at all times of the year! 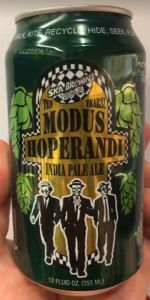 Modus Hoperandi from Ska Brewing Co.